Nneka Ogwumike motions for a teammate to set up the play. USA Basketball photo. 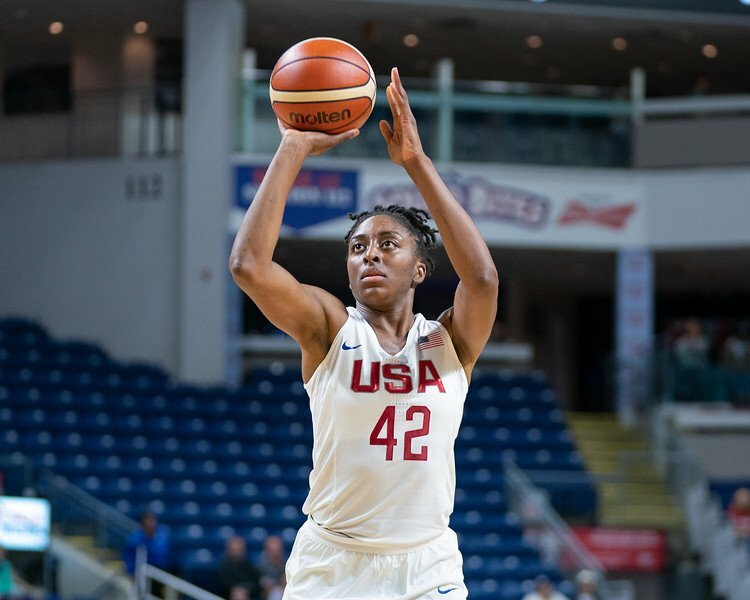 As the National Team worked through practices and scrimmages the last few weeks, in preparation for FIBA World Cup competition, a veritable rookie held court. Nneka Ogwumike conducted team huddles, took aside teammates for a few words, and directed traffic during play. 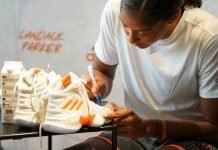 And though she was named to just her second World Cup roster last week, when the team was announced, the 28-year-old forward with the WNBA’s Los Angeles Sparks is already a giant to her peers. The former Stanford great was drafted No. 1 in 2012, won the WNBA regular-season MVP award in 2016 and helped guide the Sparks to two consecutive Finals appearances, winning one Championship. 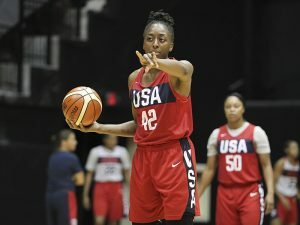 Team USA coach Dawn Staley said Ogwumike’s leadership with the National Team has been exemplary, and praised her ability to connect with and mentor the younger players through the entire camp. 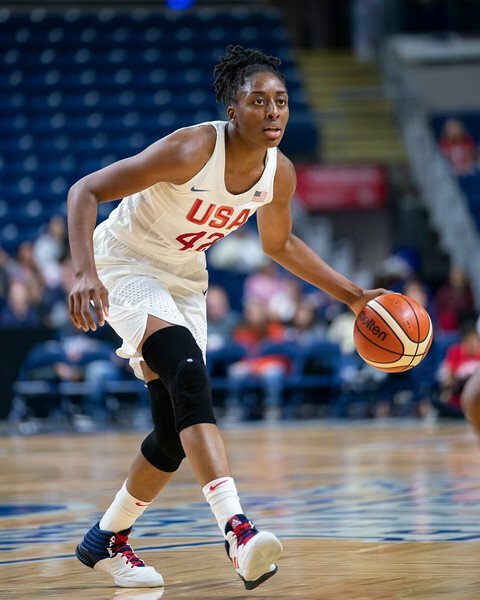 Ogwumike said the pace of her professional life has made for a lot of learning in a relatively short period of time. Nneka Ogwumike looks for a passing option. Photo by Chris Poss. The fact that Ogwumike, who hasn’t competed in the Olympics, made her first World Cup roster this year, is chocked with irony. She was MVP the same year Los Angeles won the title, at a time she was playing some of the best basketball of her life. But when the Olympic team was named that summer, Ogwumike was not on the list. 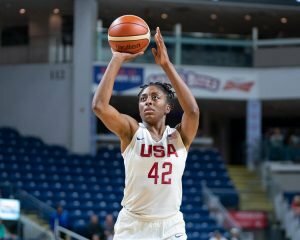 She had helped the USA win the 2014 World Cup, but on an Olympic roster stacked with veteran talent, Ogwumike was left out. This year Ogwumike and Charles, who is 29, are among the squad’s veterans, along with Sue Bird and Diana Taurasi. As the U.S. is set to open tournament play today against Senegal in Tenerife, Spain, the goal is no less than gold. Unlike two years ago, 2018 was the most difficult season of Ogwumike’s professional life. 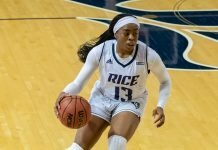 She missed several games for the Sparks, as well as the All-Star game, midseason after being diagnosed with mononucleosis, which sapped her strength. And playing a schedule that had been compressed to make up for these FIBA games, the Los Angeles team sputtered. Picked to win the Championship, the Sparks stumbled without Ogwumike after a 9-2 start, and lost five straight home games for the first time in 11 years. Los Angeles seemed particularly effected by the travel schedule, which saw teams throughout the league criss-crossing the nation to play as many as four games in a week. Practice time was sparse, and teams had to find chemistry on the fly. The Sparks fought until the end to grab a playoff spot, and defeated the defending champion Minnesota Lynx in the first round to lose to the Washington Mystics in the second. Just a week after the quick exit, it was back to the courts for Ogwumike. But despite the lack of downtime, she said the camp was rejuvenating, both on and off the court. Nneka Ogwumike shoots a free throw. Photo by Chris Poss. Ogwumike said being with a new group gives her a chance to reboot. The U.S. tips off against Sengeal Saturday at 1 p.m. ET.